Just about everywhere in Indonesia you will find that Balians, or Dukuns, are sought out to heal illnesses or dispel evil spirits. Even in a society where modern medical facilities are available, it is to the mystic person they go. There was an interesting article in the Bali Discovery regarding these most sought after members of Balinese society. Over on the neighbouring island of Java, the Javanese firmly believe that that the spiritual world is richly populated with deities who inhabit people, things, and places, and who are ever ready to cause misfortune. With the aid of a dukun, or through spiritual acts of self-control and right thinking, Javanese believe they can protect themselves against these harmful spirits by making offerings. 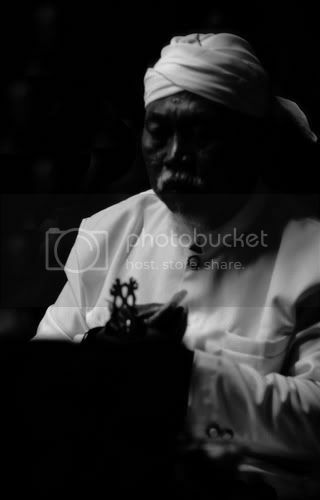 In the daily life of the Balinese the balians, or mystic mediums, play a central role. In fact, the name balian is loosely applied to a wide range of men and women who possess sacred skills or specialized knowledge in the performance of rituals of passage. Members of the elite circle of balians may be called upon to interpret ancient lontar palm manuscripts, divine messages from the gods or ancestors, decipher “signs” of spiritual import hidden in the natural world, perform midwifery duties, prepare the dead for cremation, massage the sick, set broken bones or determine which family ancestor now inhabits the soul of a newborn child. The natural inclination to humility causes many Balinese who perform balian roles in their community to deny they fill a mystical or sacred function implied by that title; much as many gifted artisans in Bali do not view themselves as artists. In an effort to understand exactly how widespread the role of the balian is in Balinese society, the Suryani Institute Bali is undertaking pioneering research to catalog the number and variety of balians operating in 20 remote villages in eastern Bali. Preliminary results from Karangasem reveal that at least 152 balians or paranormal practitioners are operating in that region, according to Dr. Cokorda Bagus Jaya Lesmana, the Secretary of the Institute quoted in NusaBali. Dr. Lesmana, a young Balinese psychiatrist who is also the Son of Indonesia’s world-renowned psychiatrist and author Professor Dr. Luh K. Suryani, claims the balian plays a central and very beneficial role in local communities ranging from alternative medical practice to performing rain stopper services. In surveying balians, the Institute intends to eventually improve cooperation and knowledge-sharing between traditional healers and modern medical practitioners with a particular emphasis on the treatment of mental illness and emotional disorders. In December 2007, the Suryani Institute Bali plans to hold a seminar involving medical and psychiatric experts and balians to discuss means of improving the mental health of local communities and curbing the rising suicide rates in Bali. Actually, one of my rellies in Java is a Dukun (through marriage) and is a really nice guy and a good one. However, several years ago I tried to seek knowledge of his good practices but was soon scorned upon.